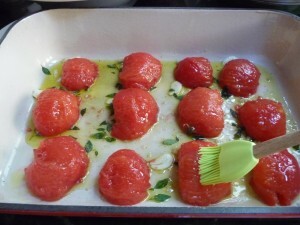 This is one of my favorite ways to bring out even more flavor in vine-ripened tomatoes. 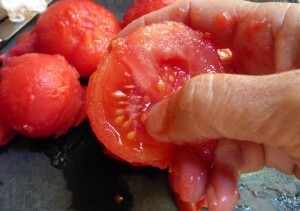 You can either peel the tomatoes first, or leave the skin on – it depends on how you would like to use them. We typically eat them right away, but I also like to use slow-roasted tomatoes in my Fresh Tomato Tart recipe. 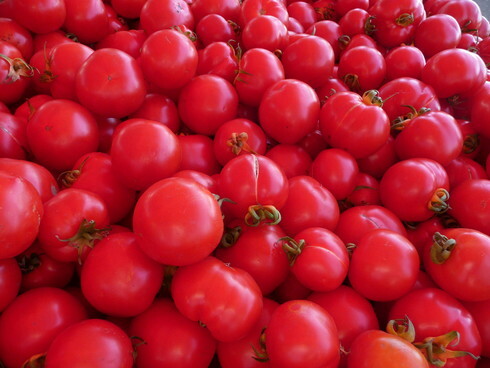 If peeling the tomatoes, fill a large pot with water and bring it to a boil. 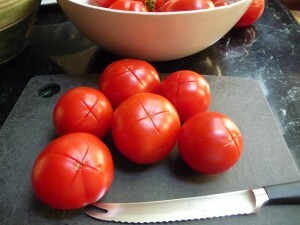 With a serrated knife, make an “x” on the top of each tomato, being careful to slice only through the outer skin. 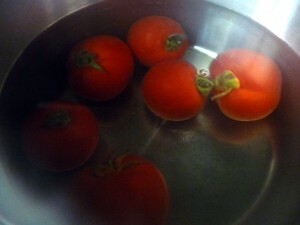 Drop the tomatoes into the boiling water for about 2 minutes. Remove them from the water and place them onto a cutting board. The skin should easily peel off. 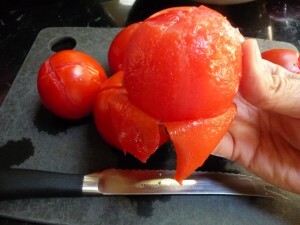 Slice each tomato in half and remove the core at the end. Using your hands, remove the seeds from each half. 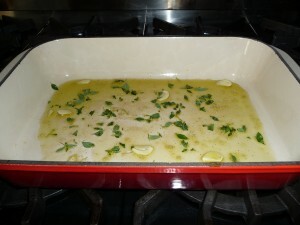 Drizzle the baking dish with enough olive oil to coat the bottom. Sprinkle with sea salt and pepper. Add the sliced garlic and spread out in the pan. Strip the leaves from the herbs and add them to the pan. Place the tomatoes, cut side down, in the pan. You can put them close together in the pan. I separated them because I was only using a few tomatoes. Brush the top with olive oil. Sprinkle with the sugar, if needed. Bake at 250 degrees Farhenheit for two hours. Remove from the oven and let cool. 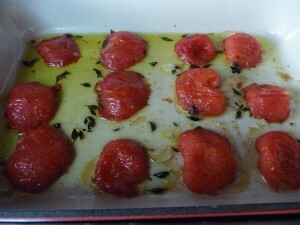 Use the tomatoes in a recipe or just enjoy them as is. Be sure to use the oil and to scrape the goodies from the bottom of the pan.